As many of you know, we pride ourselves on the education we provide, everything from Mike Maloney’s Hidden Secrets of Money series and regular video updates to our numerous articles and Insider’s program. When you buy from GoldSilver you help fund the costs for this education, which we think stands head and shoulders above what is available elsewhere in the industry. 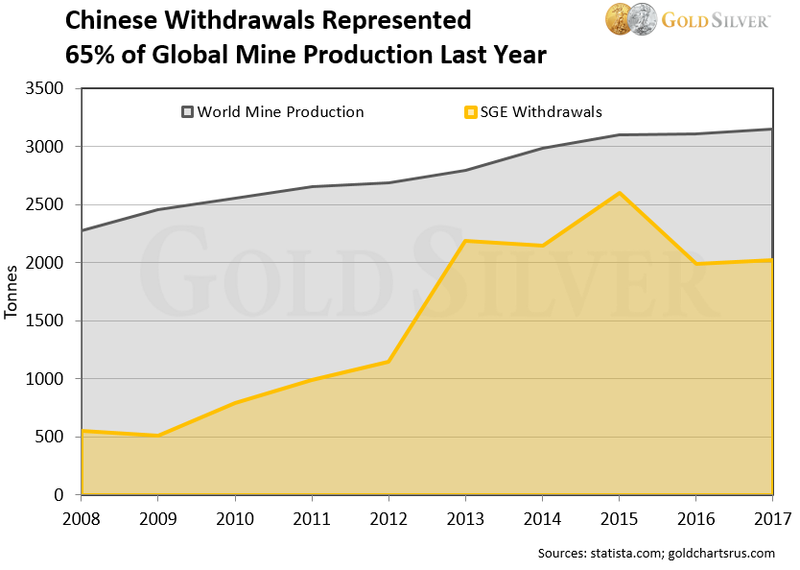 And the following is another example of the kind of in-depth research your efforts help fund… Jeff’s report on the state of the Chinese gold market below is something you probably won’t find in mainstream reporting. And the message is not only insightful but encouraging. Enjoy, and thank you again for buying from GoldSilver to support our ongoing educational efforts. China rarely releases trade data on gold, so none of this data gets reported publicly and remains unknown. Why don’t they release the data? It seems clear that leaders don’t want import figures tracked so the rest of us don’t know how much they have. This move doesn't imply demand is falling – just the opposite. And given the level of demand in the country, we know these amounts are not insignificant. And by the way, these withdrawals reduce trading volume in North America. Why? Because the Chinese don't sell. So that metal won't come back onto the market anytime soon, if ever. I saw one “Wall Streeter” express this very concern, which tells you how real this trend is. UBS reported that the number of billionaires in China jumped a whopping 39% last year, totaling 373 billionaires worth a combined $1.12 trillion. It’s almost hard to believe, but two new billionaires were created per week in China last year. This from an economy that had only one billionaire at the beginning of the century – now nearly one in five billionaires in the world is in China. The number of “ultra-wealthy” has grown, too; those holding at least 10 million yuan (US$1.5 million) in investible assets is now 1.6 million people. I ask again: what if some of this massive slosh pile of currency wants to buy gold? One billionaire could spend just a tenth of his worth ($100 million) and buy 83,333 ounces of gold (at $1,200) – the only problem being that it would gobble up 73% of all the gold produced last year from every mine in the world. Almost every report you'll see about gold reserves measures them in relation to that country’s total reserves. The US, for example, has 73% of its total Reserves in gold, while China officially has just 1.4% of its Reserves in gold. You can see that the Chinese government would have to buy 3,940 tonnes of gold –139 million ounces – to reach a 2% gold-to-GDP ratio. This would then put them on par with the top gold holders around the world. Though keep in mind their GDP is growing much faster than all those other countries including the US. Either way, this is probably a more realistic gauge of how they determine if they're closing in on their reserve goals. Keep in mind, though, that gold is not just about the price. It's about the role it will serve in your finances, investments, and everyday way of life during a major currency upheaval. And yes, further down the road, it’s also about how gold will become dramatically overvalued compared to other investment classes. If you see the future as China sees it, you need to have a meaningful exposure to physical gold. Anything that represents a small portion of your net worth will not provide the kind of asset and lifestyle protection you'll need. I don’t know about you, but I continue to buy gold. And I’m not worried about the price, because China's got my back.